If you’re still thinking about how to spend a few beautiful days in June, plan to hang out with us at the Church of San Silvestro in Capite, Italy for the Feast Day of St. John on June 24. This is yet another fabulous celebration of St. John the Baptist’s birth. The church is the location of St. John’s decapitated head. While that fact may not sound appealing to everyone, the number of individuals that come to pay respects to the relic is countless, and they come from all over the world. The item is displayed to the public year-round on a red velvet cloth and under a clear plastic box. Capite is not the only celebratory location though. Lake Como, Florence, and Fabriana are additional locations. Some of our plans include a Como Lake Day Tour. 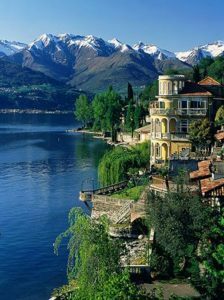 Como is one of the most romantic lakes in Italy, so don’t look for us too hard, we plan to capitalize on a little smooch ‘n snuggle (wink, wink). Small lamps float in the lake and there are also some big fireworks on display during the evening. The following morning enjoy a parade of boats decorated with flowers, folk dancing, and flag throwing competitions. These fun events are held the weekend closest to Saint John’s Day. St. John was not only the last of the great prophets to share the birth of Christ, he was also related to Jesus, the son of Elizabeth, Mary’s cousin. The Gospel according to Luke describes St. John’s birth as about six months prior to Christ, which is the reason for our June 24 celebration. 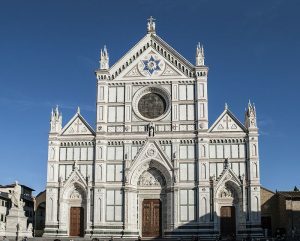 San Giovanni (John) Feast Day is celebrated in Florence on the Sunday following June 24 with a medieval tournament followed by music, drinking, and feasting. In the evening on the Arno River, there is a display of rowboats carrying lit candles followed by fireworks. While in Florence, one of our favorite things to do is visit the Innocenti Museum and enjoy breakfast on their rooftop terrace. You can also get a video guided tour. Florence celebrates the feast day for its patron saint, St. John the Baptist, with a feisty fireworks display. There, St. John is the symbol of moral rectitude and political correctness. Medieval Florence sought to build its economic fortune and good government of the Republic based on that symbolism. The image of the saint was even stamped on the city’s currency, the florin. If you’re a morning person, join us for an early Tour of Florence. It includes a guided visit to the Piazzale Michelangelo of the Accademia Gallery. In Fabiano, St. John’s celebration is a four-day event. Fabiano is in the Marche region and here you find tapestries made of flower petals, medieval competitions, crafts, food stands and a flag throwing competition. This beautiful coastal region borders the Adriatic Sea. You can also experience boat rides on the Arno, assorted parades, and fireworks in other Italian locations. The day is also used to commemorate the opening of the San Niccolò Tower, by the Arno River. Our fabulous Florence Boat Tour will help you further appreciate the beauty in this cradle of the Renaissance city. If you enjoy sporting events, attend the 5 pm Calcio Storico Fiorentino on June 24, at the Piazza Santa Croce. A 16th-century aggressive game that combines soccer, rugby, and wrestling YIKES! Arrive an hour early for the parade! This is where you will also want to loop in a Basilica of Santa Croce tour. We’ll be watching for you in each of these locations, so don’t be late booking your trip today. It’s sure to be a fun, relaxing, culturally educational time. Ci vediamo in Italia (see you in Italy)!